Pictured from left are Prof Edgardo Mansilla and current students, Aaron Clark, who is in Practicum at KYA and Liz Perkins, who is in practicum at LaCasita Center. On the right, pictured with Prof Larry Michalczyk, are former Kent school grads Cortney Downs & Mara Powell, both of whom completed their practicums at KYA and are now on staff there as children’s advocates. Kent Policy students Janet Buntain, Lizzie Odom and Cortney Foster attended the Citizens of Louisville Organized and United Together (CLOUT) Community Problem Assembly last night with Larry Michalczyk and Rev Cindi Weber from Jefferson Street Baptist Community at Liberty. CLOUT will continue its social justice work by focusing on Affordable Housing, Restorative Justice in the Schools and Mental Health and Substance Abuse. A new area of focus was added, Senior Concerns. Students watched excerpts of the documentary "The Hunting Ground" and followed with an engaging discussion and group activities about sexual assault in college and potential advocacy responses. 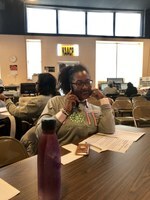 MSSW students in Dr. Shawnise Miller's Social Justice Practice (SW 603) were hard at work on Election Day 2018 volunteering with "Get Out the Vote" efforts at the Louisville Branch of NAACP and Kentuckian's for the Commonwealth of Louisville, Louisville Office. Val Farsetti, MSW, AASW presented to Kent policy students on her micro and macro sustainable health work in Belize, Chile, Kenya and China. MSSW student Hallie Decker presented a poster at Research! Louisville as part of her practicum placement on October 10th at the Kosair Charities Clinical and Translational Research Building on UofL’s Health Sciences Campus. Hallie, supervised by Susan Sawning, presented a poster overviewing the eQuality Project at the University of Louisville School of Medicine and the forthcoming eQuality Toolkit, a clinical skills manual for medical students and health practitioners wishing to learn about inclusive practice with LGBTQ+ populations in healthcare settings. Research!Louisville is an annual celebration of health-related research that promotes excellence and public awareness of health sciences.